"Krishna Chaitanya" redirects here. For the Telugu lyricist, see Krishna Chaitanya (lyricist). Krishna Chaitanya (IAST: Kṛṣṇa Caitanya), honorific: "Mahāprabhu" ("Great Lord"), (18 February 1486 – 14 June 1534), was a Bengali Hindu mystic, saint, and the chief proponent of the Achintya Bheda Abheda and Gaudiya Vaishnavism tradition within Hinduism. He also expounded the Vaishnava school of Bhakti yoga (meaning loving devotion to God), based on Bhagavata Purana and Bhagavad Gita. Of various forms and direct or indirect expansions of Krishna such as Lord Narasimha (Krishna in mood of anger), Maha-Vishnu and Garbhodakshaya Vishnu respectively, he is Krishna in the mood of a devotee. He popularised the chanting of the Hare Krishna mantra and composed the Siksastakam (eight devotional prayers) in Sanskrit. His followers, Gaudiya Vaishnavas, revere him as a Krishna with the mood and complexion of his source of inspiration Radha. His birthday is celebrated as Gaura-purnima. Chaitanya is sometimes referred to by the names Gauranga or Gaura due to his fair complexion, and Nimai due to his being born underneath a Neem tree. Idol of Shadabhuja Gauranga at Ganga Mata Math in Puri. Chaitanya (Bengali: চৈতন্য) means '"consciousness"; Maha means "Great" and Prabhu means "Lord" or "Master". Chaitanya was born as the second son of Jagannath Mishra and his wife Sachi Devi. Jagannath's family lived in the village of Dhakadakshin, Golapganj, Srihatta, Bengal. According to Chaitanya Charitamruta, Chaitanya was born on the full moon night of 18 February 1486, at the time of a lunar eclipse. Alternatively, Chaitanya is also believed to born in Mayapur. Mayapur is located on the banks of the Ganges river, at the point of its confluence with the Jalangi, near Nabadwip, West Bengal, India, 130 km north of Kolkata (Calcutta). Mayapur is considered a holy place by a number of other traditions within Hinduism. A number of stories also exist telling of Chaitanya's apparent attraction to the chanting and singing of Krishna's names from a very young age, but largely this was perceived as being secondary to his interest in acquiring knowledge and studying Sanskrit. When travelling to Gaya to perform the shraddha ceremony for his departed father, Chaitanya met his guru, the ascetic Ishvara Puri, from whom he received initiation with the Gopala Krishna mantra. This meeting was to mark a significant change in Chaitanya's outlook and upon his return to Bengal the local Vaishnavas, headed by Advaita Acharya, were stunned at his external sudden 'change of heart' (from 'scholar' to 'devotee') and soon Chaitanya became the eminent leader of their Vaishnava group within Nadia. After leaving Bengal and receiving entrance into the sannyasa order by Swami Kesava Bharati, Chaitanya journeyed throughout the length and breadth of India for several years, chanting the divine Names of Krishna constantly. At that time He traveled on foot covering a lot of places like Baranagar, Mahinagar, Atisara at last Chhatrabhog. Chhatrabhog is the place where Goddess Ganga and Lord Shiva met, then hundred mouths of Ganga was visible from here. From the source of Vrindaban Das's Chaitanya Bhagavat. He bathed at Ambulinga Ghat of Chhatrabhog with intimate companions with great chorus chanting(kirtan). After staying one night He set for Puri by boat with the help of Local Administrator Ram Chandra Khan. He spent the last 24 years of his life in Puri, Odisha, the great temple city of Jagannath in the Radhakanta Math. The Gajapati king, Prataprudra Dev, regarded Chaitanya as Krishna's avatar and was an enthusiastic patron and devotee of Chaitanya's sankeertan gatherings. It was during these years that Chaitanya is believed by his followers to have sunk deep into various Divine-Love (samādhi) and performed pastimes of divine ecstasy (bhakti). Vrindavan, the land of Radha Rani, the “City of Temples” has more than 5000 temples to showcase the pastimes of Radha and Krishna, including temples as old as 5500 years. The essence of Vrindavan was lost over time until the 16th century, when it was rediscovered by Chaitanya. In the year 1515, Chaitanya visited Vrindavana, with the purpose of locating the lost holy places associated with Lord Sri Krishna's transcendent pastimes. He wandered through the different sacred forests of Vrindavana in a spiritual trance of divine love. It was believed that by His divine spiritual power, he was able to locate all the important places of Krishna's pastimes in and around Vrindavan including the seven main temples or sapta devalay, which are worshiped by Vaishnavas in the Chaitanya tradition to this day. By 10 o'clock the night was very dark and cloudy. Across the Ganges in a northern direction I suddenly saw a large building flooded with golden light. I asked Kamala if he could see the building and he said that he could. But my friend Kerani Babu could see nothing. I was amazed. What could it be? In the morning I went back to the roof and looked carefully back across the Ganges. I saw that in the place where I had seen the building was a stand of palm trees. Inquiring about this area I was told that it was the remains of Lakshman Sen's fort at Ballaldighi. Taking this as a clue, Bhaktivinoda conducted a thorough, painstaking investigation of the site, by consulting old geographical maps matched against scriptural and verbal accounts, and eventually came to a conclusion that the village of Ballaldighi was formerly known as Mayapur, confirmed in Bhakti-ratnakara as the actual birth site of Chaitanya. He soon acquired a property in Surabhi-kunj near Mayapur to oversee the temple construction at Yogapith, Chaitanya's birthplace. For this purpose he organized, via Sajjana-tosani and special festivals, as well as personal acquaintances, a massive and hugely successful fundraising effort among the people of Bengal and beyond. Noted Bengali journalist Sisir Kumar Ghosh (1840-1911) commended Bhaktivinoda for the discovery and hailed him as "the seventh goswami" – a reference to the Six Goswamis, renowned medieval Gaudiya Vaisnava ascetics and close associates of Chaitanya who had authored many of the school's texts and discovered places of Krishna's pastimes in Vrindavan. There are numerous biographies available from the time giving details of Chaitanya's life, the most prominent ones being the Chaitanya Charitamrita of Krishnadasa Kaviraja, the earlier Chaitanya Bhagavata of Vrindavana Dasa (both originally written in Bengali but now widely available in English and other languages), and the Chaitanya Mangala, written by "Lochana Dasa". These works are in Bengali with some Sanskrit verses interspersed. In addition to these there are other Sanskrit biographies composed by his contemporaries. Chief among them are the works, Śrī Caitanya Caritāmṛtam Mahākavyam by Kavi Karnapura and Śrī Kṛṣṇa Caitanya Caritāmṛtam by Murari Gupta. 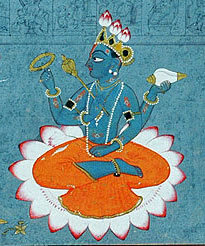 According to the hagiographies of 16th-century authors, he exhibited his Universal Form identical to that of Krishna on a number of occasions, notably to Advaita Ācārya and Nityānanda Prabhu. Gaudiya Vaishnavas consider Chaitanya to be Lord Krishna himself, but appearing in covered form (channa avatar). The Gaudiya Vaishnava acharya Bhaktivinoda Thakura had also found out the rare manuscript of Caitanya Upanisad of the Atharvaveda section, which reveals the identity of Chaitanya. Chaitanya and Nityananda, is shown performing a 'kirtan' in the streets of Nabadwip, Bengal. Pancha Tattva deities installed on a Vaishnava altar. From left to right: Advaita Acharya, Nityananda, Chaitanya, Gadadhara Pandita, Srivasa. 60 feet Chaitanya Mahaprabhu statue in Nabadwip. Chaitanya Mahaprabhu in Prachin Mayapur, Nabadwip. Yogapith, the birthplace of Chaitanya Mahaprabhu. Built in the 1880s by Bhaktivinoda Thakur (1838-1914) in Mayapur (West Bengal, India). Gaura Nitai shrine at ISKCON Temple Delhi. Chaitanya has left one written record in Sanskrit called Siksastakam (though, in Vaishnava Padavali it is said: "Chaitanya himself wrote many songs on the Radha-Krishna theme"). Chaitanya's epistemological, theological and ontological teachings are summarised as ten roots or maxims (dasa mula). The statements of amnaya (scripture) are the chief proof. By these statements the following ten topics are taught. Krishna is the source of all rasa- flavor, quality, or spiritual rapture/emotions. Despite having been initiated in the Madhvacharya tradition and taking sannyasa from Shankara's tradition, Chaitanya's philosophy is sometimes regarded as a tradition of his own within the Vaishnava framework – having some marked differences with the practices and the theology of other followers of Madhvacharya. He took Mantra Upadesa from Isvara Puri and Sanyasa Diksha from Keshava Bharati. Chaitanya is not known to have written anything himself except for a series of verses known as the Siksastaka, or "eight verses of instruction", which he had spoken, and were recorded by one of his close colleagues. The eight verses created by Chaitanya are considered to contain the complete philosophy of Gaudiya Vaishnavism in condensed form. Chaitanya requested a select few among his followers (who later came to be known as the Six Gosvamis of Vrindavan) to systematically present the theology of bhakti he had taught to them in their own writings. The six saints and theologians were Rupa Goswami, Sanatana Goswami, Gopala Bhatta Goswami, Raghunatha Bhatta Goswami, Raghunatha dasa Goswami and Jiva Goswami, a nephew of brothers Rupa and Sanatana. These individuals were responsible for systematising Gaudiya Vaishnava theology. Narottama Dasa, Srinivasa Acarya and Syamananda Pandit were among the stalwarts of the second generation of Gaudiya Vaishnavism. Having studied under Jiva Goswami, they were instrumental in propagating the teachings of the Goswamis throughout Bengal, Odisha and other regions of Eastern India. Many among their associates, such as Ramacandra Kaviraja and Ganga Narayan Chakravarti, were also eminent teachers in their own right. In the early 17th century Kalachand Vidyalankar, a disciple of Chaitanya, made his preachings popular in Bengal. He traveled throughout India popularizing the gospel of anti-untouchability, social justice and mass education. He probably initiated 'Pankti Bhojon' and Krishna sankirtan in eastern part of Bengal. Several schools (sampradaya) have been practicing it for hundreds of years. Geetashree Chabi Bandyopadhyay and Radharani Devi are among many who achieved fame by singing kirtan. The Dalits in Bengal at that time neglected and underprivileged cast readily accepted his libertarian outlook and embraced the doctrine of Mahaprabhu. His disciples were known as Kalachandi Sampraday who inspired the people to eradicate illiteracy and casteism. Many consider Kalachand as the Father of Rationalism in East Bengal (Purba Banga). The festival of Kheturi, presided over by Jahnava Thakurani, the wife of Nityananda, was the first time the leaders of the various branches of Chaitanya's followers assembled together. Through such festivals, members of the loosely organised tradition became acquainted with other branches along with their respective theological and practical nuances. Around these times, the disciples and descendants of Nityananda and Advaita Acharya, headed by Virabhadra and Krishna respectively, started their family lineages (vamsa) to maintain the tradition. The vamsa descending from Nityananda through his son Virabhadra forms the most prominent branch of the modern Gaudiya tradition, though descendants of Advaita, along with the descendants of many other associates of Chaitanya, maintain their following especially in the rural areas of Bengal. Gopala Guru Goswami, a young associate of Chaitanya and a follower of Vakresvara Pandit, founded another branch based in Odisha. The writings of Gopala, along with those of his disciple Dhyanacandra Goswami, have had a substantial influence on the methods of internal worship in the tradition. From the very beginning of Chaitanya's bhakti movement in Bengal, Haridasa Thakur and others, Muslim or Hindu by birth, were participants. Sri Ramakrishna Paramahamsa, the great sage of Dakshineswar, who lived in the 19th century, emphasized the bhakti marga of Chaitanya, whom he referred to as "Gauranga." (The Gospel of Sri Ramakrishna). This openness received a boost from Bhaktivinoda Thakura's broad-minded vision in the late 19th century and was institutionalised by Bhaktisiddhanta Sarasvati in his Gaudiya Matha in the 20th century. In the 20th century the teachings of Chaitanya were brought to the West by A. C. Bhaktivedanta Swami Prabhupada (1896-1977), a representative of the Bhaktisiddhanta Sarasvati branch of Chaitanya's tradition. Prabhupada founded his movement known as The International Society for Krishna Consciousness (ISKCON) to spread Chaitanya's teachings throughout the world. Saraswata gurus and acharyas, members of the Goswami lineages and several other Hindu sects which revere Chaitanya Mahaprabhu, including devotees from the major Vaishnava holy places in Mathura District, West Bengal and Odisha, also established temples dedicated to Krishna and Chaitanya outside India in the closing decades of the 20th century. In the 21st century Vaishnava bhakti is now also being studied through the academic medium of Krishnology in a number of academic institutions. Chaitanya's influence on the cultural legacy in Bengal and Odisha has been significant, with many residents performing daily worship to him as an avatar of Krishna. Some attribute to him a Renaissance in Bengal, different from the more well known 19th-century Bengal Renaissance. Salimullah Khan (b. 1958), a noted Bangladeshi linguist, maintains, "Sixteenth century is the time of Chaitanya Dev, and it is the beginning of Modernism in Bengal. The concept of 'humanity' that came into fruition is contemporaneous with that of Europe". Noted Bengali biographical film on Chaitanya, Nilachaley Mahaprabhu (1957), was directed by Kartik Chattopadhyay (1912-1989). ^ Srimad Bhagavatam (Introduction) Archived 25 May 2013 at the Wayback Machine "Lord Caitanya not only preached the but propagated the teachings of the Bhagavad Gita as well in the most practical way." ^ Sri Chaitanya Mahaprabhu "He spread the Yuga-dharma as the practice for attainment of pure love for Radha-Krishna. That process is Harinam-Sankirtan, or the congregational chanting of the Holy Names of Krishna "Hare Krishna Hare Krishna Krishna Krishna Hare Hare, Hare Rama Hare Rama Rama Rama Hare Hare"
^ "Gaura Purnima". www.krishna.com. Retrieved 16 December 2008. ^ Sri Chaitanya Mahaprabhu: His Life and Precepts by Bhaktivinoda Thakura Archived 17 May 2014 at the Wayback Machine "Chaitanya Mahäprabhu appeared in Nabadwip in Bengal just after sunset on the evening of the 23rd Phälguna 1407 Shakabda, answering to 18 February 1486, of the Christian Era. The moon was eclipsed at the time of His 'birth'"
^ CC Adi lila 17.9 "In Gayla, Sri Chaitanya Mähaprabhu was initiated by Isvara Puri, and immediately afterwards He exhibited signs of love of Godhead. He again displayed such symptoms after returning home." ^ Teachings of Lord Chaitanya "They were surprised to see Lord Chaitanya after He accepted his sannyasa order from Kesava Bharati"
^ History of Gaudiya Vaishnavism. The first 6 years, he traveled extensively from Rameshavara in South India to Vrindavan in North India, sharing the message of bhakti. He is also said to have achieved major intellectual successes in converting intellectual giants of his times such as Sarvabhauma Bhattacharya and Prakashananda Saraswati to his devotional understanding of Vedanta. "Chaitanya spent the remainder of His life, another 24 years, in Jagannäth Puri in the company of some of His intimate associates, such as Svarüpa Dämodara and Rämänanda Räya"
^ Gaudiya Vaishnavas Archived 2 March 2009 at the Wayback Machine "His magnetism attracted men of great learning such as Särvabhauma Bhattächärya, the greatest authority on logic, and Shree Advaita Ächärya, leader of the Vaishnavas in Bengal, and men of power and wealth like the King of Odisha, Pratap Rudra and his minister, Rämänanda Räya..."
^ Srimad Bhagavatam, Introduction Archived 25 May 2013 at the Wayback Machine "At Puridhawm, when he [Chaitanya] entered the temple of Jagannätha, he became at once saturated with transcendental ecstasy"
^ Srimad Bhagavatam (Introduction) Archived 25 May 2013 at the Wayback Machine "Lord Caitanya not only preached the Srimad-Bhagavatam but propagated the teachings of the Bhagavad Gita as well in the most practical way." ^ Fuller 2005, p. 209. ^ Fuller 2005, pp. 243-250. ^ Thakura, B. (1993). Jaiva dharma: The universal religion (K. Das, Trans.). Los Angeles, CA: Krishna Institute. ^ TLC: Lord Chaitanya's Mission Archived 3 February 2014 at the Wayback Machine "Although Lord Caitanya was widely renowned as a scholar in His youth, He left only eight verses, called Sikshashtaka"
^ History of Gaudiya Vaishnavism "He requested ... the Six Goswamis of Vrindavan, to systematically present ... the theology of bhakti he had taught"
^ Sherbow, P.H. (2004). "AC Bhaktivedanta Swami's Preaching in the Context of Gaudiya Vaishnavism". The Hare Krishna Movement: the Postcharismatic Fate of a Religious Transplant: 139. ^ Bengal Studies Conference Archived 17 December 2014 at the Wayback Machine "History says that the Bengali people experienced the renaissance: not only once but also twice in the course of history. Bengalis witnessed the first renaissance in the 16th century when Hossain Shah and Sri Chaitanya’s idealism influenced a sect of upper literal class of people"
^ Sur, Ansu; Goswami, Abhijit (1999). Bengali Film Directory. Nandan, West Bengal Film Centre. p. 96. Rosen, Steven (1988). Indiaʼs spiritual renaissance: the life and times of Lord Chaitanya. Folk Books. ISBN 0-9619763-0-6. Nair, K. K. (2007). Sages Through Ages – Volume II: India's Heritage. AuthorHouse. ISBN 1-4208-7802-6. Retrieved 7 April 2013. Sandipan Manna (2013). In Search of a Forgotten Mahatma: Kalachand Vidyalankar (I ed.). Kalyani Foundation. ISBN 978-81-927505-4-5. Fuller, Jason Dale (2005). Bhaktivinode Thakur and the transformation of religious authority among the Gauḍīya Vaisṣṇavas In nineteenth-century Bengal (Ph.D.). University of Pennsylvania. UMI Microform 3179733. Retrieved 8 June 2014. Das, Khudiram (2017). Sri Chaitanya and Gaudiya Vaishnava Dharma (Ebook). Wikimedia Commons has media related to Chaitanya Mahaprabhu. This page was last edited on 2 April 2019, at 10:58 (UTC).